I love ABBA. And when I saw this pic I loved it and had to include it in my post. 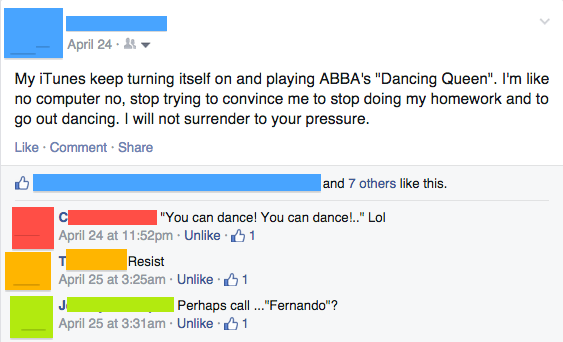 I love all their songs, but the first one that got me into the band was Dancing Queen. The song was released in 1976 and took the world by storm, number one in many places-Europop and Disco at its finest. In fact Anni-Frid Lyngstad said the first time it made her cry-she felt its connection and knew that others would have the same draw to it. It was performed for Swedish King Carl XVI Gustaf of Sweden and his bride-to-be, Silvia Sommerlath on the night before their wedding. Then on Queen Silva’s 50th birthday, Anni-Frid Lyngstad performed Dancing Queen for her again. This song has been covered by lots of bands and singers, and been in many movies and TV shows. Of course the most famous being Mama Mia! I think we love this song because it does connect to all of us, no matter the age. So yesterday I was driving my car and listening to the ’80s station on Amazon Prime Music. As I was listening to them, I was thinking how everyone has at least one ’80s power song they listen to-when they are sad, angry, hurt, happy. We all have at least one we love to crank out. I mean we all have at least one, I have a gazillion. So as I was listening, Every Rose Has It’s Thorn by Poison came on and it made me think of Mr. Darcy. If Mr. Darcy lived today, I believe that’s the song he would be playing. So imagine that Darcy has just told Elizabeth that he wants to marry her. And she has said no. Darcy is feeling pretty dumb. And I’m sure that in today’s time he would have immediately texted Bingley and been told how very dumb he was. So when Darcy got home and needed to crank out a song to feel better, Every Rose Has Its Thorn is the One to Play. I can just see Mr. Darcy thinking of Pemberley and seeing how empty it will be without Elizabeth, the woman he wanted as his wife. And now I’ve ruined my only chance with her! And to think she’s with his hated enemy, Mr. Wickham! Don’t worry Darcy, it will get better.